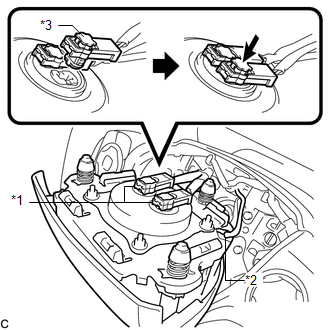 (c) Connect the 2 airbag connectors to the steering pad. (e) Connect the horn connector to the steering pad. (f) Push the steering pad to engage the 3 pins carefully. Make sure that the pins are securely inserted into the steering holes. Make sure to engage the 2 upper pins first. 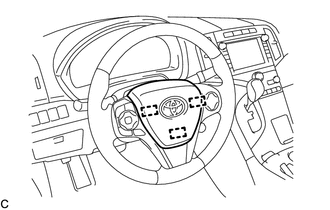 Make sure that the steering pad is securely installed. (a) Engage the claw and guide to install the lower No. 3 steering wheel cover. (a) Engage the claw and guide to install the lower No. 2 steering wheel cover. (a) Make sure that the horn sounds. If the horn does not sound, inspect the horn system (See page ).